Chromira roll-to-roll printers have superb production efficiency. This is achieved through imaging systems design and usage, print head capabilities, operational simplicity, easy workflow integration, and “bottleneck-free technology”. The last provides full front-end printer access to every computer on an imager’s network ensuring rapid order placement and sequencing. ZBE offers two speeds of printers to match specific customer requirements. The Chromira’s 300 PPI working resolution is the highest standard image resolution in the industry. To attain even higher image quality, Chromira utilizes ZBE’s patented Resolution Enhancement Technology, which achieves a visual resolution of 425 PPI. While other digital printers (such as leading laser printers) must image at lower resolutions of 200 PPI to reach production speeds, Chromira printers run at the highest resolution. Chromira roll-to-roll printers are the recognized standard for reliability, easy operation, and low total cost of ownership. They hold competitive advantages in affordability, reliability, easy maintenance, and low part cost. Given customer need for additional digital capacity, ZBE offers the opportunity to upgrade Chromira 30 and 50 printers to the faster productivity of 5x printers. Produces digital images in print sizes of 50” x continuous. Handles any material width up to 50” and any length up to 164’. Easy and fast loading and unloading (less than one minute). Very low operational and maintenance costs. Material Size: Roll to Roll in any width up to 50”, and any length up to 164’. Loading or unloading time: less than 1 minute. Print Sizes: 50” x continuous. Image files are scaled on-the-fly to any desired print size. Physical: 88″ L x 36″ W x 60″ H (224cm x 91cm x 152cm). Access required on 3 sides, desirable on all 4. Will fit through 30″ (76cm) door, by removing top of cabinet. Weight: 930lbs. (418Kg). Connections: 120/230VAC, 1000 W. Network connections 10base T or 100base T. Compressed air (60-100 psi). Print Speed: 16″ (40.6 cm) per minute for 50″ (127 cm) paper, depending on file size and degree of enlargement or reduction. Image scaling, rotation & color balancing performed “on-the-fly” while printing. Equals: 333 square feet (30 square meters). This equates to: 600 – 8”x10” (20.3 x 25.4 cm) prints; or 274 – 11”x14” (27.9 x 35.6 cm) prints; or 96 – 20”x24” (50.8 x 61 cm) prints per hour from 50” material. Each workstation on the network has full control of “front end” printer functions eliminating bottlenecks. Each workstation has full control of: print size, image rotation, job priority, borders, and text notes on prints, color balance and number of prints. Optional WorkStream software package offers the on-the-fly imaging capabilities of Workstation with such additional benefits as packaging, order management, production tracking and the integration of labs and their customers, which streamlines workflow and maximizes productivity. Optional automated print cutter. Automates cutting of package prints and nested individual prints from roll. Q: What kind of files can Chromira print? A: Chromira can print RGB TIFF, JPEG and BMP files. The TIFF files may be either PC or MAC type. Other file types (such as Postscript) must first be converted to TIFF in order to be printed on Chromira. Postscript files are converted to TIFF files with a Raster Image Processor (RIP). Q: What does it mean that Chromira’s resolution is specified as 425 Pixels per Inch of visual resolution? A: Chromira uses ZBE’s patented Resolution Enhancement Technology, a special optical system, which produces a diamond-shaped pixels that overlap and effectively creates a sharper, higher resolution visual of 425 Pixels per Inch. Q: How does the Chromira’s resolution compare with the resolution of an inkjet printer? A: Images printed on Chromira are far superior in image quality to images from an inkjet printer. The resolution of Chromira is specified in continuous tone Pixels per Inch. Inkjet printers specify resolution in Dots (of ink) Per Inch. It is generally considered that it takes 5-6 times the resolution in dots per inch to match continuous tone resolution. Thus it would take an inkjet printer with at least 1500 Dots per Inch of resolution to equal the quality of Chromira’s prints at 300 Pixels per Inch. Q: Will the Chromira include a RIP? A: Chromira is designed to work with popular RIP packages that can produce RGB – TIFF, BMP or JPEG files. The Chromira can print the RGB TIFF files which are the “RIPped” output of most popular RIP software. Many labs already have RIP packages, which they use to drive other printers. This can drive the Chromira as well. Q: What materials can Chromira print on? A: The Chromira prints on virtually all RA4 photographic materials both paper and film. Q: Does Chromira require materials with special “digital imaging” emulsion? A: Chromira works with virtually every RA4 emulsion. However, Chromira works especially well with digital imaging emulsions designed to maximize output on digital printers. Q: Can Chromira print on Black & White materials? A: No, B& W materials are not compatible, but Chromira Printers make beautiful B&W prints on color media. Q: How does Chromira connect to our computer(s) or workstation(s)? A: Chromira does not plug in like a desktop printer. Chromira has a built in Windows XP Workstation computer, which connects to other computer(s) over the network much like any other PC. Files travel over the network to Chromira as they are being printed. Everything needed to interface to the network is included with Chromira. The lab need only to supply the network cable to plug into Chromira. Q: Do we need to purchase a separate workstation to dedicate to Chromira? A: No. Chromira has Windows XP built in. Q: Chromira has a built-in Windows XP computer; can we store our images there? A: Yes, but it is not recommended. Digital image files can be quite large. The Chromira is designed so that it prints images from files stored on the network. It is not necessary to move an image file to the computer embedded within the Chromira prior to printing. The Chromira can retrieve the image from wherever it resides on the network, as it is needed printing. It works like this: When Chromira is ready to begin printing an image; it retrieves the first inch of the image to be printed. That portion of the image is scaled, color corrected, and rotated if needed. Then, it prints. As soon as the first inch begins printing, Chromira retrieves the next inch of the image. The processing of the second inch occurs while the first inch is printed. In this way, there are no long interruptions in printing or bottlenecks in your network while large files are being copied. Q: If we do not have a network, can we still use Chromira? A: Chromira does not absolutely require a network to operate. Files can be printed from CDs and DVDs, as well as being received over a network. Q: Since Chromira is PC based, how can I print images from my MAC? A: Chromira can print RGB TIFF files in both MAC and PC formats. MAC images can be brought to Chromira via 1) Network, 2) DVD, or 3) CD. Q: Does the machine need a darkroom? A: Yes, Chromira must be loaded and unloaded in darkness. After loading, the doors are closed and Chromira can be operated in normal light. Q: Why does Chromira require a compressed air supply? A: Chromira uses air to actuate some of the moving parts. This reduces wear and allows for part of the longevity Chromira is known for. Q: How fast does Chromira print? A: Chromira 5x 50 prints at approximately 16 inches per minute for images a full 50″ wide depending on the scaling and rotating of the image. Narrower images may print slightly faster. With prints that are not being reduced in size, or rotated, Chromira prints at full speed. Large files, being printed at a reduced size, can slow down Chromira due to the required data processing time. Similarly, heavy network traffic can delay access to a file to be printed. That could cause Chromira to pause briefly for data. Q: Can Chromira print a “full bleed” to the edge of the paper? Q: On what paper widths can Chromira print? A: The Chromira 50 accepts paper widths as small as eight inches and as large as 30″. We recommend a minimum of 20” and a maximum of 50” for the Chromira 50. Q: How can I print images larger than 50″ wide on the Chromira 50? A: Images larger than 50″ wide (depending on the Chromira model) can be printed in strips. Q: What is the largest print I can make? A: The length of the print is limited only by the length of the roll of paper and image file. Q: How much paper is lost when threading Chromira? Q: What is the minimum number of prints I can make before unloading the printer? A: One. However, you will lose approximately 24″ of paper each time you unload and rethread the paper. Q: What is the maximum number of prints I can make before unloading the paper? A: You can queue up as many prints as you like. Chromira can print an entire roll of paper, unattended. When the roll runs out, the printing stops and waits for a new roll. Q: How do I know if there is enough paper left in Chromira to print a job? A: Chromira keeps track of the paper supply as well as the amount of exposed paper. When the paper supply is low, a warning message is posted on the screen. Q: How is Chromira calibrated? A: Primary calibration of Chromira is executed by first printing a test calibration image. The calibration image has a series of gray patches ranging from white to black. The gray patches are read with a densitometer, which connects into the computer. Chromira calibrates automatically from these densitometer readings. This process is generally called “linearizing” the machine. Q: How does color management work on Chromira? A: Color management on Chromira works by applying a “profile” to the image being printed. The purpose of the profile is to make adjustments to the colors as specified in the image file so that colors of the printed result will precisely match the colors of the original. In practice, color profiles will adjust the color differences between brands of paper. It will probably be necessary to have a different profile for each brand and type of paper being printed. The profile is normally applied to the image file during RIPping. Q: Where do I get color profiles for the material I am using? A: Contact ZBE for reference to available ICC printer profiles. A: Yes. Color and density are easily adjusted when you print the image. Q: Do I have to make test prints? A: Chromira prints are much more consistent and predictable than photographic prints made optically. However, critical color applications may still require test prints since prints can never perfectly match a computer monitor. Q: How many LEDs does Chromira have? A: To print with LEDs it is necessary to have Red, Green and Blue LEDs. Rumors of a 4th, Black LED are not true. ZBE’s precision control circuitry allows Dmax to be attained using Red Green & Blue only, without the need for the black LED. Q: Can I make multiple prints of a single image? A: Yes. Simply specify the number of prints when submitting the job. Q: Can I make multiple prints of differing size from a single image? A: Yes, the Chromira allows for the resizing of any single image. Q: Can Chromira nest prints, side by side on the roll? A: Yes, Chromira’s automatic nesting feature will instantly result in the printing of any set of images side by side to reduce paper waste and automatically maximize imaging productivity. Q: Can Chromira interface with any automatic cutters? A: Yes. An optional accessory of the Chromira is the Chromira Trim, an automatic squaring cutter. 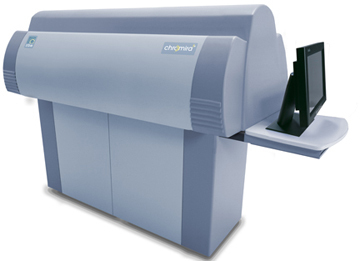 Chromira also interfaces with the ChromiraTrim XY, which is designed to provide highly productive print cutting for mid-to-high volume digital imagers. Q: What is the skill level required to operate Chromira? A: Anyone experienced with loading paper in any printer can learn to load and unload Chromira in about 5 minutes. Anyone with basic Windows computer skills can quickly and easily learn to submit prints to Chromira. Q: Can a prospective customer send in a file for ZBE to print a sample? Q: In the event of a technical problem, what happens? A: Chromira automatically performs a complete self-diagnostic every time it is turned on. Any problems are immediately reported. In the event that the automatic self-test does not identify the problem, the next stage is a set of operator assisted self tests. Sophisticated fault diagnosis software guides the machine operator through a complete set of tests. Chromira prompts the machine operator with voice messages to manually actuate each component of the machine. Chromira monitors the results and generates a comprehensive log of tests. In most cases this will clearly identify the fault. The log of tests can then be e-mailed to ZBE for verification and subsequent action.